When descending a steep or slippery hill, it’s important to consider the consequences of losing traction and being unable to stop on the slope. If you’re pointing directly up or down-slope it’s relatively easy to control your direction even without the ability to stop, however if you start to slide sideways you’re best course of action may be to close your eyes and wait for the crunch. Stop well before the slope begins and get out of the car. Check the slope for obstacles and ensure you have a suitable run-off area in the event of complete loss of traction. 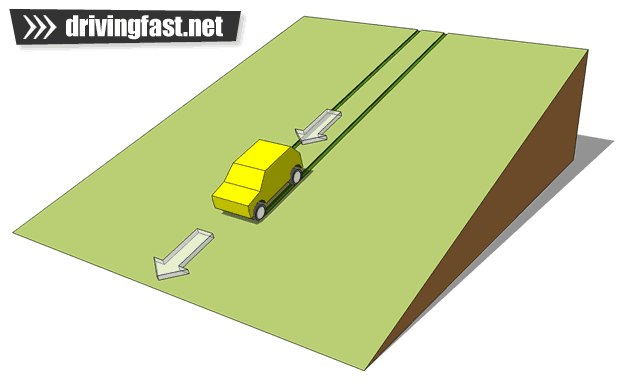 Stick to existing tracks if possible (ruts will help prevent you sliding sideways). Select a gear which is suitable for the conditions and the severity of the slope. Low gears provide better engine braking, but may cause a loss of traction on particularly low grip surfaces. Engage any differential locks you have fitted, and turn on any electronic aids designed to help descents. Pull away, and ensure the clutch is completely released (if you’re in a manual) before the slope begins. Ensure you are lined up correctly and your wheels are completely straight when beginning the descent. Do not touch the brakes unless you need to come to a stop – this will either trigger ABS, or make the wheels likely to lock which will mean you’ll be unable to steer. Use engine tick over to ensure maximum engine braking, avoid using the throttle or brakes.